When Osiris (Bryan Brown) decides to relinquish his crown as king of Egypt to his son Horus (Nikolaj Coster-Waldau), Osiris' brother Set (Gerard Butler) decides to commit a coup. Set kills Osiris and gouges out his nephew's eyes, taking away his powers and appoints himself king of Egypt. Now, Zaya (Courtney Eaton), a follower of Horus', asks her boyfriend Bek (Brenton Thwaites) to steal Horus's eyes out of Set's vault so Horus can regain his powers and reclaim his place on the throne. "Gods of Egypt" is a film that has been surrounded with a ton of controversy, most of which began before it was ever released. This film has been set as the latest example of Hollywood whitewashing. There was so much backlash that the director and producers issued apologies on their casting choices right after the first trailer was released. Now, while we aren't here to talk about this controversy, we feel we should mention it because it has put a stain on the movie, and not just within the cinephile community. This film is now being called "the first official box office flop of 2016," which is truly saying something being that it's only March. Could this may have had something to do its low returns? Now that we have seen it, we think yes and no. Onward, then! 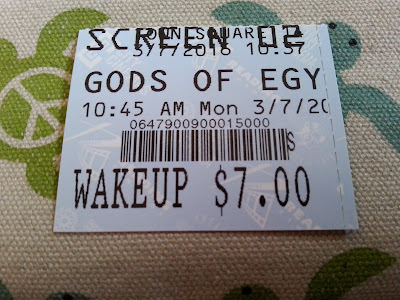 Alex Proyas' "Gods of Egypt" is an absolute mess from the second it begins. Proyas has made some solid science fiction films in the past including "Dark City," and "I-Robot," which begs the questions, what happened here, and what have you done with him, alien species who has almost certainly kidnapped him? Honestly, this movie is a failure on so many levels. It is a shiny CGI bomb that looks completely artificial in every possible way. Hell, even the sand the characters walk on in several scenes looks green-screened! The graphics look like something you'd find in a two-bit video game from the mid-2000's, which is not a flattering comment. Almost nothing looks natural. Sure, the buildings look cool from time to time, but they are desperately phony and so is everything else. Second, the story is all over the place. It has a totally disjointed narrative with almost no organic flow from scene to scene. It starts at point "A" and ends up at point "H" without explaining where points B-G went. Third, the characters are all just there. They exist in this world with gigantic gods and puny mortals and we don't really care about any of them, where they came from, their plights, or where they want to end up or what they want to accomplish. Bek, played by Brenton Thwaites, looks completely out of place as a peasant thief b-movie Aladdin wannabe with his curly hair and dopey face running around ancient Egypt with a British accent babbling about true love. Bek never really looks all that dirty from scene to scene. Seriously, in one scene he is rolling around in dirt, and in the next, it looks like he had just been to a shower spa. He is amazingly well kept for someone without any indoor plumbing, as does his girlfriend Zaya, played Courtney Eaton. Really? You're walking through the windy, dirty gates of hell to the afterlife and you look like you just stepped off a runway? Who would have though ancient Egypt was filled with so many people who look like fashion models all the time!? COME. ON. HOLLYWOOD. Now, it's not all bad. We were expecting it to be much worse. Our scores might not reflect this entirely, but at least it wasn't "Dirty Grandpa" bad (we are still mad and hate and loathe that movie). There is a lot of action in "Gods of Egypt" though the vast majority of it, much like everything else, looks sure artificial. There are a couple of entertaining, fun moments, and BigJ really enjoyed when Set, played by Gerard Butler, and Horus, played by Jamie Lannister, err, Nikolaj Coster-Waldau, became their robo-animals. I felt they were a little too "Transformers" for my tastes and again, they didn't really fit into the story. That's ultimately the problem here. This movie doesn't know what it wants to be, and instead of picking and sticking with one thing, it throws a mishmash of ideas into one collective pot and none of it ever sticks together as a well made, well told, original story. It ended up making us laugh because of how bad it is, which is never good for a non-comedy. It wants to be a movie about ancient Egyptian gods, but wants them to turn into robot versions of their god animal form, and wants them to walk around hell without any rules, and is quick to say a character can't do this one specific thing only to let them do said specific thing later on in the movie!! UGH!!! 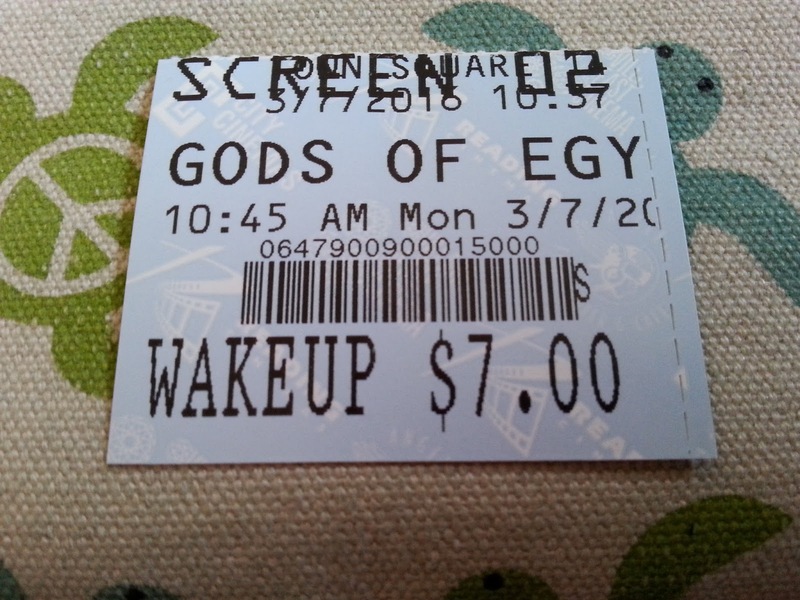 The bottom line is "Gods of Egypt" should serve as both a lesson and a warning to Hollywood. Making movies with over $100 million budgets, terrible video game-esque graphics, hardly any cohesive story, a mess of a narrative, and tons of horribly miscast actors is not the way to get butts in seats to see your movies. Moviegoers are wising up to what films are worth seeing in the theater, and judging by the box office returns on "Gods of Egypt," it clearly wasn't worth it. Now that we have seen it, we can 100% see why. It is this year's "Jupiter Ascending," only with worse graphics and a lack of an imaginative story. The movie is all over the place as a rambling, pithy love story and a nonsensical but expected revenge tale shoehorned together to make yet another audienceless movie with no good acting to be seen, apart from Elodie Yung, who plays Hathor, who gives the only compelling performance in the film. 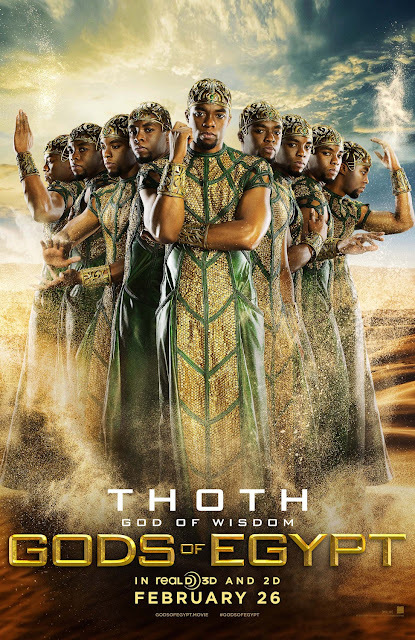 Chadwick Boseman, who we really like as an actor, is almost unwatchable as Thoth, and we hate this movie for giving him his first bad performance. Gerard Butler is the absolute wrong casting choice, as he almost always is these days, and the whitewashing of his character isn't the only reason why this is the case. Butler can't seem to pick which accent he wants to use: an English accent, his natural Scottish tongue, or a strange hybrid of the two. Stop trying to make Gerard Butler a thing. His time is over. Avoid this movie at any and all costs. One year ago, we were watching: "The Second Best Exotic Marigold Hotel"